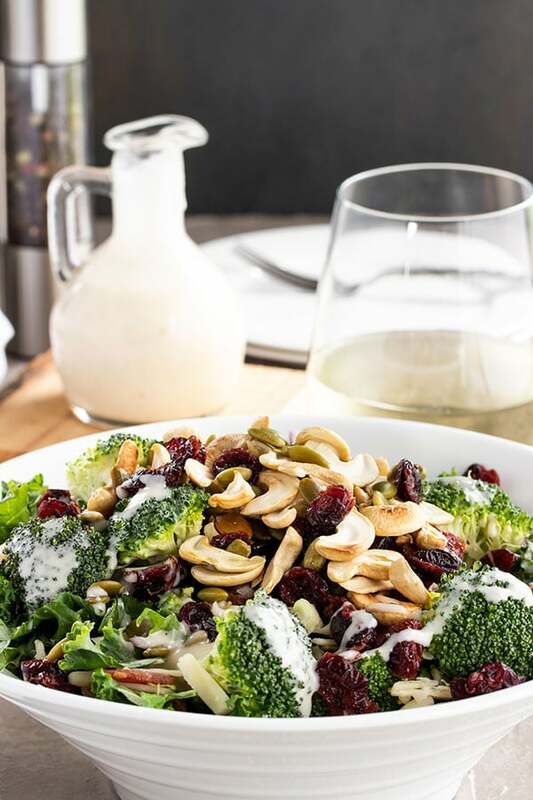 This broccoli salad recipe will even have broccoli haters asking for more. 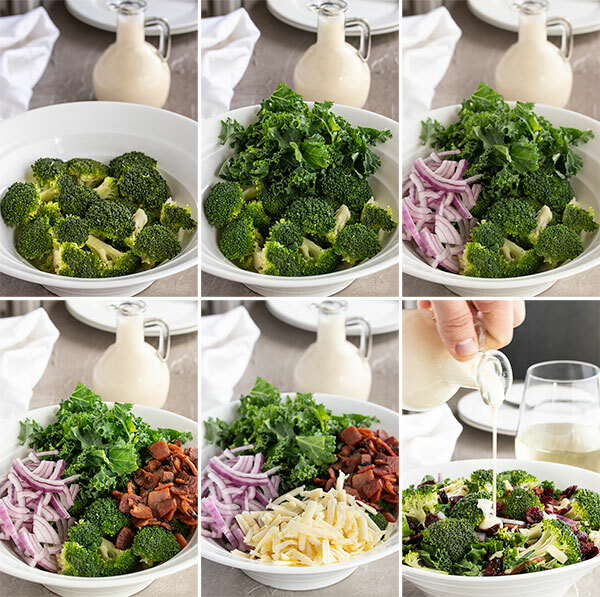 Bacon, cranberries, cheese and a super simple dressing make this broccoli salad the perfect diner, BBQ, or potluck salad this summer. It’s a long time favorite in our family and we hope it will become yours as well. I’m sure that the first time I ever had this kale and broccoli salad, Debbie made it. It was a long time ago and back then I wasn’t really much of a broccoli fan, and I probably didn’t even know what kale was, but I remember being shocked at how good it was. Since then, I have grown to love broccoli and kale and especially love it in this easy broccoli salad. When I make this broccoli salad recipe, I make a big bowl so I can just munch on it for a few days. another kind of cheese! We used old cheddar, but you could use swiss or monterrey jack or a spicy cheese for some kick. chop and cook your bacon. Set them aside till you are ready to serve. make the dressing – add the mayo, vinegar, maple syrup, salt and pepper to a jar or container and mix well. Set aside in the fridge. wash and chop your broccoli, kale and onions. Add them to a bowl. add the shredded cheese, cranberries, pumpkin seeds, bacon and nuts to the bowl. 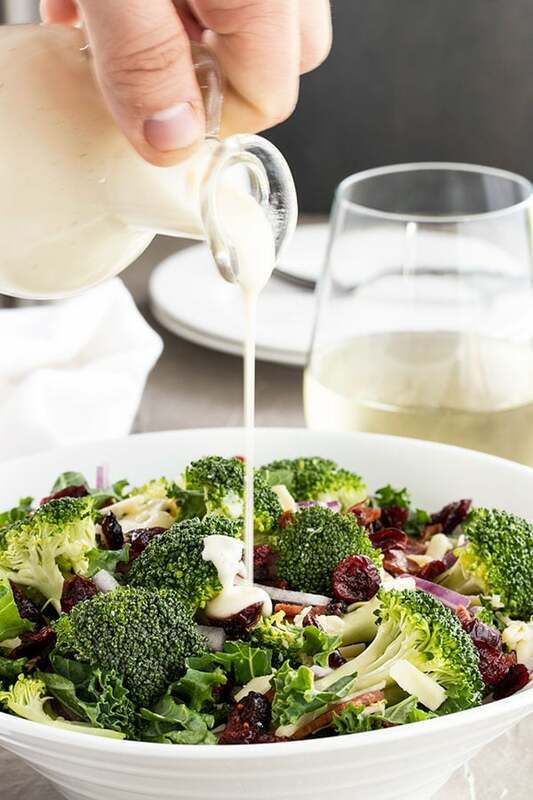 pour on the dressing, mix well and serve. No! 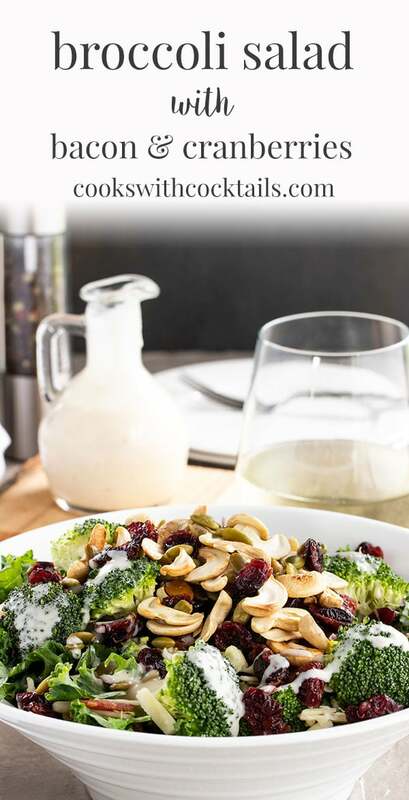 You just add the broccoli to this salad raw which is one thing that makes this salad so easy. The dressing slightly softens the broccoli as it sits so that it doesn’t taste completely raw. If you can’t stand raw broccoli, you can blanch it quickly before putting the salad together. Add the broccoli to boiling water for 30 seconds to 1 minute. Remove and transfer to a bowl of ice water for a quick cold dip to stop the cooking process. Drain the broccoli really well and let it sit to dry a bit before making the salad. How long in advance can you make broccoli salad? You can make the broccoli salad and the dressing up to a day or two even ahead of time and store it covered in the fridge. But don’t put the dressing on the salad and toss it until an hour or so before serving. If you like crunchy nuts and bacon, add those at the last min before serving. How long can you keep this broccoli salad recipe in the fridge? Store your broccoli salad in the fridge with a tight fitting cover on. We love these big glass containers with airtight lids for storing all kinds of things in the fridge, and they are great for this salad too! 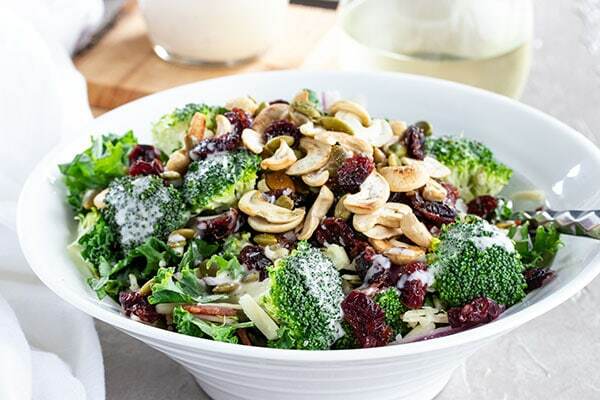 This special broccoli salad recipe will even have broccoli haters asking for more. 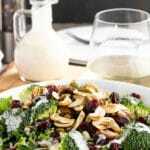 Bacon, cranberries, cheese and a super simple dressing make this broccoli salad the perfect diner, BBQ, or potluck salad this summer. It's a long time favorite in our family and we hope it will become yours as well. Heat a skillet on medium high heat. Chop the bacon into small pieces and cook them in the skillet till they are crispy. Drain the bacon on some paper towel and set aside. In a small bowl mix the dressing ingredients. Season to your tastes with salt and pepper. You may need to add a little more vinegar to thin it out. It should be slightly runny so that it will be enough to coat all the veggies. Set aside or in the fridge till you are ready to use it. Wash the broccoli and kale well. 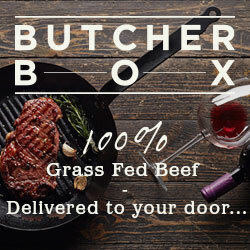 Chop into bite size pieces. Add them to a large bowl. Add the shredded cheese, cranberries, sunflower seeds, cashews and bacon. When you are ready to serve the salad, pour the dressing on top and toss it well. Serve within an hour.
. Like idea with the nuts instead of bacon and cheese. Love this! Yes, the bacon and cheese will be even better!